Volunteers play a vital role in the arts. Without them, many activities would not happen. Across the UK there are around 63,000 voluntary arts groups, regularly involving more than 10 million people participating voluntarily in cultural activities*. Step Change Studios works with volunteers who support its inclusive dance activity. Its volunteers not only make an important difference but also gain tremendous personal benefits. Volunteer Faye Harrison shares her experience. 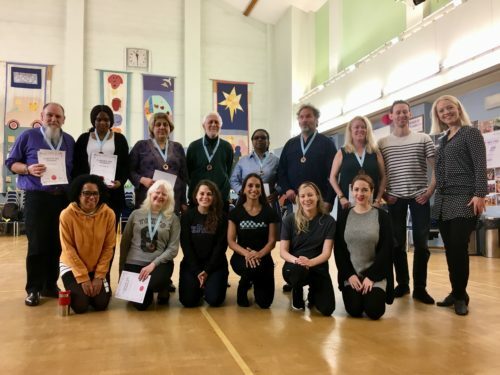 My name is Faye Harrison and I have been volunteering with Step Change Studios since September 2018. I have danced my entire life, taking classes in everything from Argentine Tango to Tap. I spent much of my childhood and teens focusing on Ballroom and Latin partner dances. Dance has always been an integral part of my life. It has allowed me to meet so many people and taught me a lot about setting goals and have fun whilst working towards them. I have always had a deep interest in sharing my love for dance with others, particularly with people who may have difficulties in accessing dance opportunities. I was keen to get involved with and learn from a company that was providing a space for disabled dancers to develop their skills in a professional environment and was lucky to discover Step Change Studios’ show ‘Fusion’ at Sadler’s Wells. The production was a fusion of dance styles and celebration of inclusive dance. It led me to do some research into the background and vision of the organisation. I contacted them immediately to see if there would be any opportunity for me to volunteer and Rashmi Becker (Founding Director of Step Change Studios) replied quickly and enthusiastically! Rashmi and I met to discuss the various types of classes that Step Change Studios run and how I might be able to support the different groups in London. It was a great opportunity to discuss my interests and we discovered we have a lot in common, all centered around a love of dance! It was also great to have that initial conversation in order to chat through any apprehensions I had and get a clear understanding of how the classes are formatted. The role of the teacher and volunteer was clearly explained and I couldn’t wait to get started. After that meeting, I was invited to support two initiatives; a wheelchair dance performance group, and a blind and visually impaired group, both once a week. My experience with the VI group has been incredibly fun and inspiring; not only have I had the chance to be in the class learning from excellent teachers, but I have been able to dance with a group of people who have taught me a lot and opened up my perspective on what it means to dance with a disability. I have got so much out of the classes. The support from the teachers and fellow volunteers has been wonderful in instilling a sense of confidence in me which I know will permeate into other areas of my life going forward. I also like to think that the other volunteers and I bring another dynamic to the group and enable the classes to be truly inclusive. Performing at the Design Museum with the wheelchair dance group was an experience I will never forget. As a group we had a couple of months to learn and rehearse the piece with our fantastic teacher and choreographer. We were all really nervous but excited to have this amazing opportunity to come together in a performance that showcased how dance is for everyone. I’m already looking forward to other performance opportunities in the future, something I hadn’t anticipated before I started volunteering. I feel very lucky to continue to support such a wonderful organisation and look forward to class every weekend. I would highly recommend coming along to a class if anybody is considering becoming a volunteer. You will find that once the music starts, we are all together as dancers and having a great time!